My girls are obsessed with fortune-tellers. Just obsessed. And, who can blame them? I was a bit obsessed myself when I was a child. When I was a child, they were often designed to actually tell a fortune. Will you live in a mansion, travel to Paris, or have 10 children? 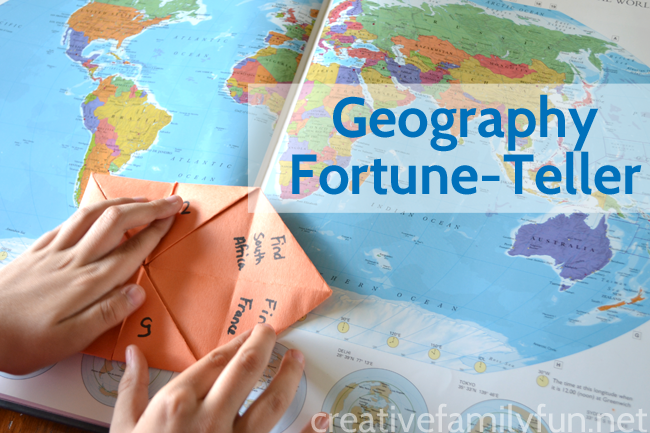 We came up with some of the most outrageous fortunes! But, nowadays, I often see fortune tellers used as a learning game. I just love this re-invention of an old toy. 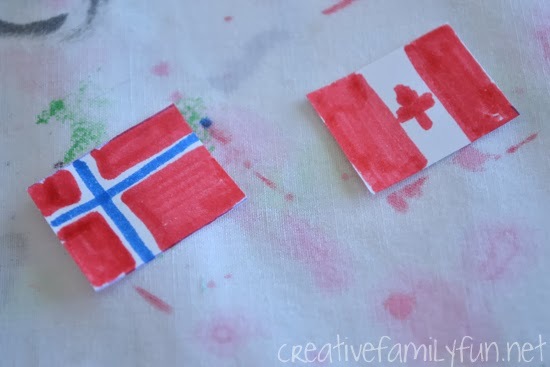 We decided to use them as a geography activity and my girls just loved this process. They’ve been playing with their Geography Fortune-Tellers again and again and again. Recently, my friends from The Educators’ Spin on It sent us a copy of their new book 100 Fun & Easy Learning Games for Kids: Teach Reading, Writing, Math and More with Fun Activities by Amanda Boyarshinov and Kim Vij. My girls have devoured this book. They’ve got activity after activity bookmarked to try. The book is great for kids in preschool through third grade and many of the activities can be adapted to your kid’s ability. Not only that, but Kim and Amanda have already provided three different variations for each activity. I love how flexible this book is! 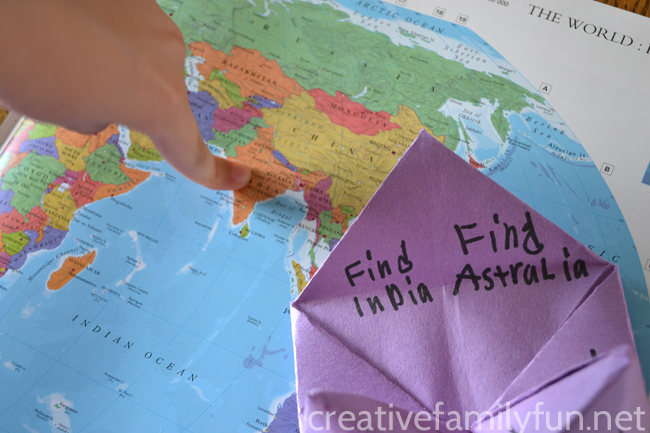 All of the different variations provided for each activity was why it was so easy for us to add our own twist to their Continent Fortune-Tellers project. 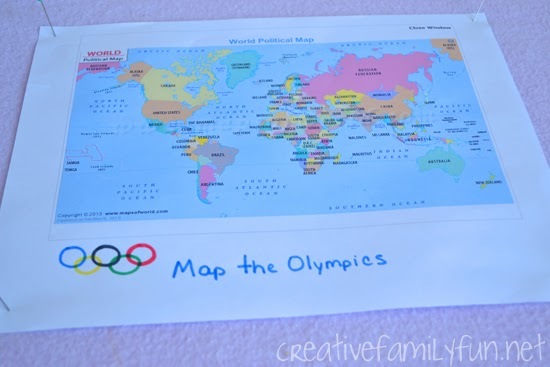 My third grader already knows all the continents. So, in order to make it more challenging for her, we switched out the continents for individual countries. We each made our own fortune-tellers. That was part of the fun for my girls! The folding instructions in the book were very easy to follow. 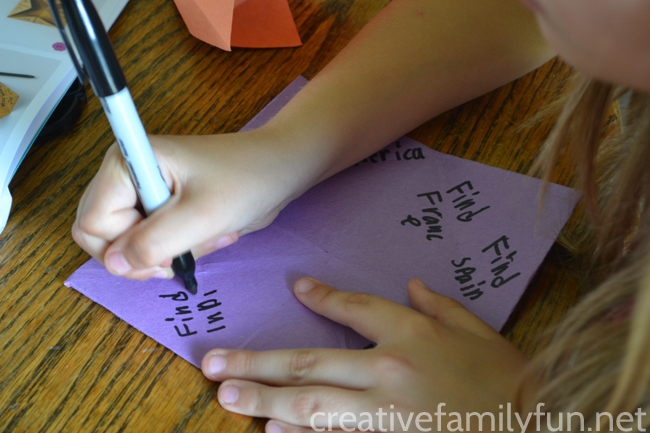 Once it was folded, we lifted all the flaps and wrote “Find (a specific country)” We added numbers to the outsides of the flaps. One thing I really loved (and I know you will too) about this book is that the instructions are clear and easy. Plus, the book is full of beautiful full-color pictures. 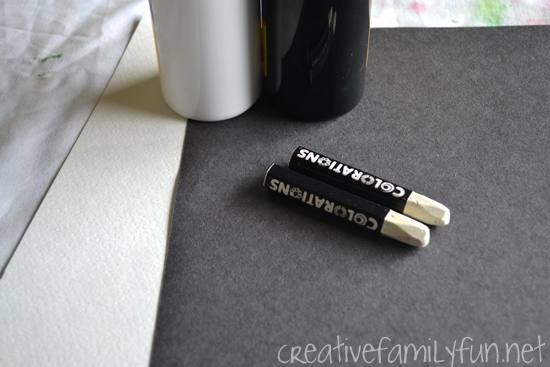 I always prefer to see pictures to go along with kids crafts and activities – that’s why I love blogs so much. And, this book delivers. My girls are both drawn to the pictures and have leafed through the book many times since it arrived on our doorstep. 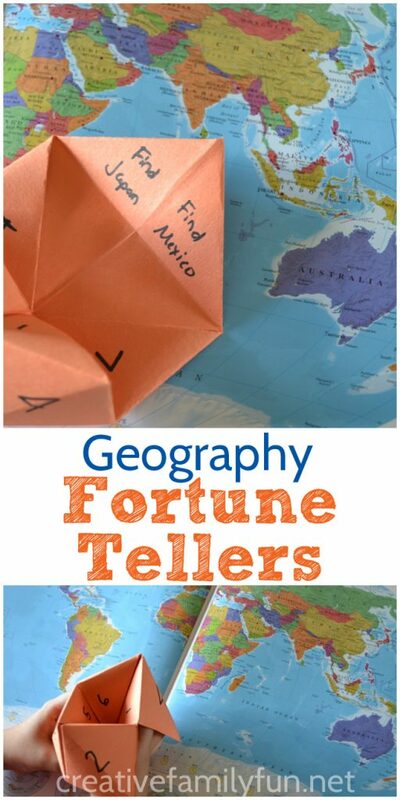 My girls scoured the globe to find the countries to add to their fortune-tellers. 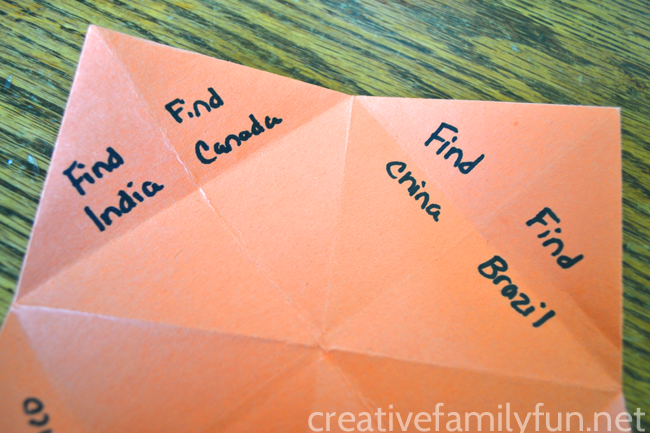 I made mine easier for my first grader to use, but the girls made some challenging fortune-tellers. Find Mali, find Somalia, and find Laos. Can you do it? 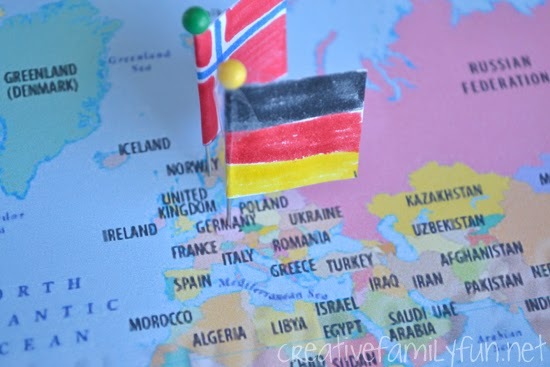 Thanks to their fortune-tellers, my girls can easily find these countries. 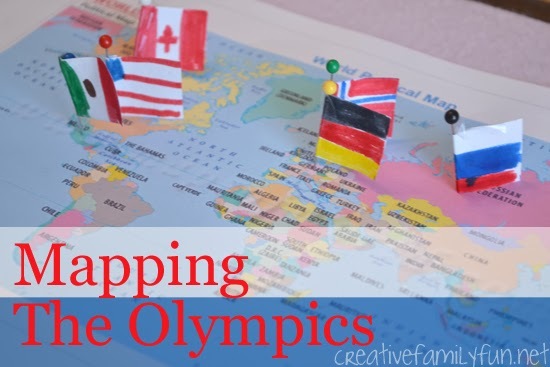 If you don’t want to do the continents or even countries for this geography activity, you could try oceans, US states, major cities, or famous landmarks. There are just so many ways to add your own spin on it. To play the game, you choose a number. The person with the fortune-teller moves it back and forth that many times. Then, choose another number and the person with the fortune-teller will move it back and forth that many time. Finally, choose one more number and lift the flap. Find that country on a map or globe. Keep going as many times as you want. 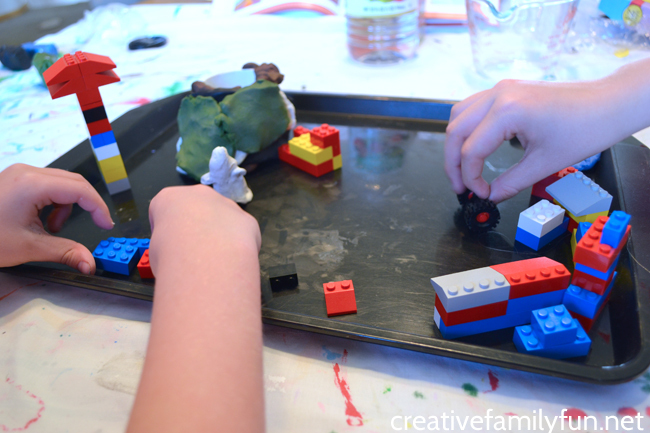 I can’t recommend 100 Fun & Easy Learning Games for Kids enough. 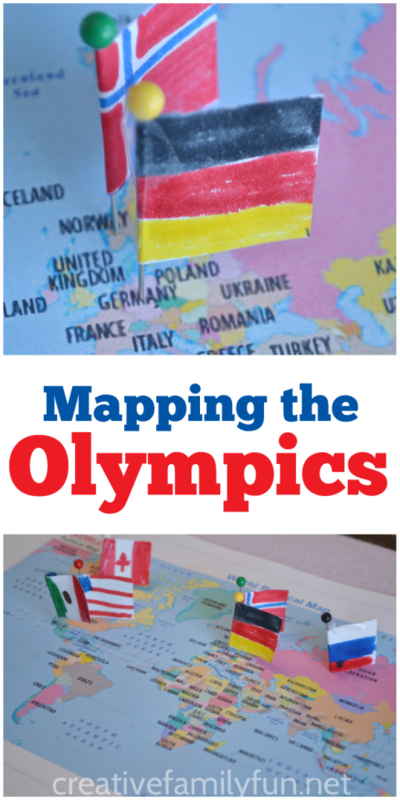 You’ll find reading, writing, math, science, music, art, and geography activities. 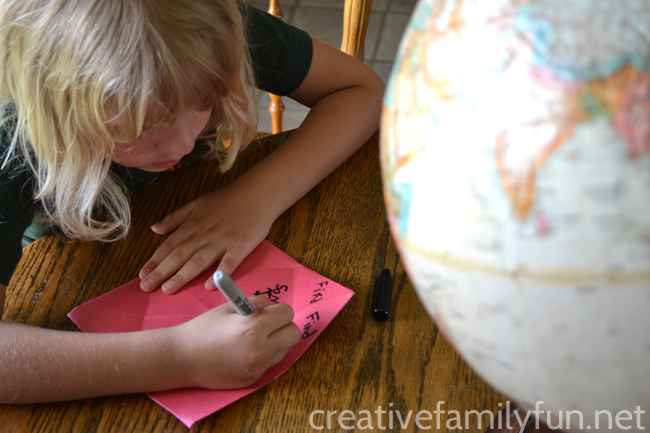 It’s a fun source for after-school activities to enforce what your kids are learning in school or a great source for learning activities to help prevent summer slide. The games are fun. We’ve already tried out more than this in the short time we’ve had the book. I know we’ll have fun all summer! Thank you Kim and Amanda for writing such a fun book! You can grab your own copy at Amazon here at this link. I’m not sure if there’s a kid these days that hasn’t made a volcano. It’s such a classic science experiment. It’s fun to put together and it’s fun to watch the eruption. Both of my girls have done this experiment before. In fact, they’re old hands at it. So, it was time to kick it up a notch and combine some history, some science, and a good book into one fun activity. 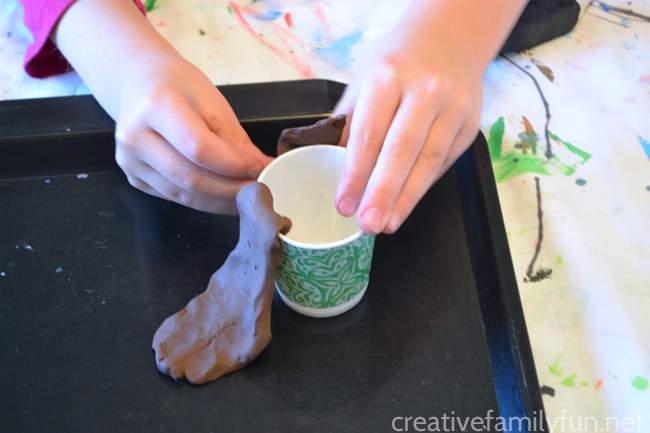 We’re going to learn about Pompeii and recreate the eruption of Mount Vesuvius. Have you read any of the books in the You Wouldn’t Want to series? We discovered them about a year ago and have been enjoying them whenever we find them at the library. 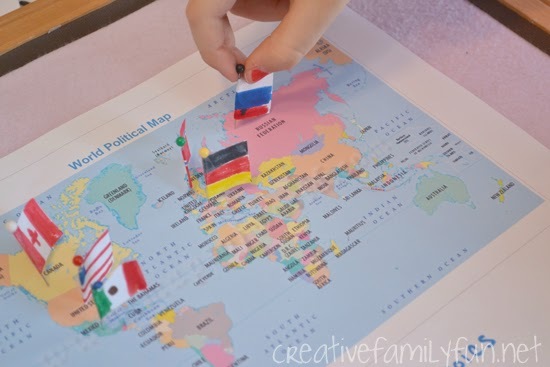 This series is such a fun way to learn about history. You learn about the gritty and real parts of history in a kid-appropriate way. 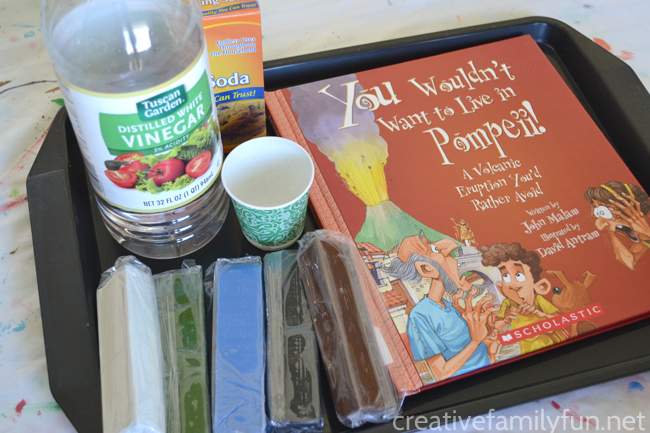 Recently, we brought home You Wouldn’t Want to Live in Pompeii! A Volcanic Eruption You’d Rather Avoid by John Malam. Pompeii is such a fascinating story. It seems like the plot of a good fiction book, only it’s very, very real. In this book we became a resident of Pompeii. We learned about what life was like in the town in AD 79. We lived through the days leading up to the eruption, we experienced just how frightening it was during the eruption, and we learned what life was like for those who survived. This book covered a lot of good stuff. 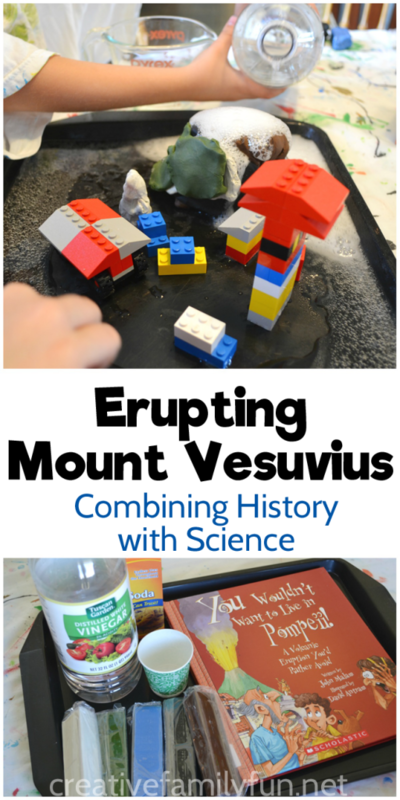 Once we were done reading, we were ready to recreated the eruption of Mount Vesuvius. We used a small cup and some modeling clay to create our volcano. Once Mt. 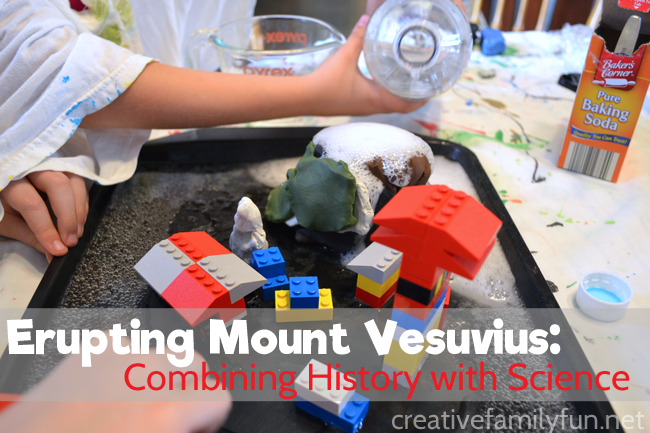 Vesuvius was complete, we put it in the corner of our plastic tray and got to work building Pompeii. Note: You’ll want to do this experiment on an enclosed surface. It will get messy! We used a plastic tray. If you don’t have a plastic tray, a baking sheet will also work well. 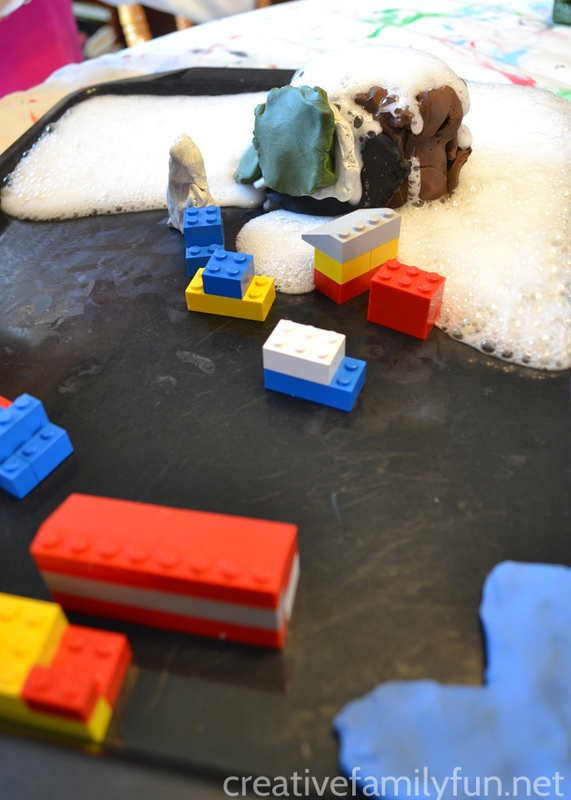 We used our Legos and built a tiny town to represent Pompeii. We had houses, a library, a school, a vineyard, and a river made out of clay. Finally, it was eruption time! My girls filled the cup half full of baking soda. We wanted a big eruption. Then, they added the white vinegar. Boom! Mount Vesuvius erupted and the lava flowed toward Pompeii. We knew our experiment wasn’t quite complete. We missed the tremors that happened for days before and also the ash that fell from the sky before the lava started flowing. So much ash and pumice fell that roofs began to collapse and started burying the town. By the time it was over, the ash, lava, and volcanic debris completely buried the town. But, wait a minute! What about the science? Baking soda is a base and vinegar is an acid. When the two meet, a chemical reaction occurs which creates carbon dioxide – the bubbling, fizzing reaction. The carbon dioxide creates a pressure which pushes your mixture out of the cup similar to the pressure that pushes the molten rock out of the volcano. I’ve always loved bringing history alive. It’s such a great way to explore and learn about the world, both past and present. And, it was so much fun to tell the story of Pompeii through science. It’s a lesson we’ll never forget! 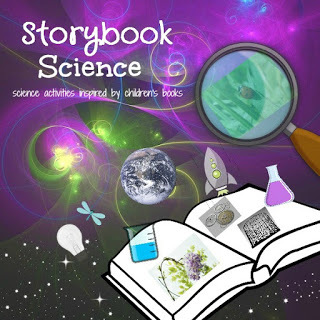 This post is part of the Storybook Science series which links great kids’ books with fun science project. Click the button below (or click here) to find the rest of the participants in the series. The weather is finally getting nice. We’re know for our cold winters, with plenty of snow and temperatures plunging down below zero degrees Fahrenheit. But when the weather is nice, we get outside. Minnesota marks the beginning of the Mississippi River in Itasca State Park. It begins as a small stream that you can walk across. We’re known for our lakes and have over 90,000 miles of shoreline. That’s more than California and Florida – combined! The lakes are where you often find our state bird, the common loon. 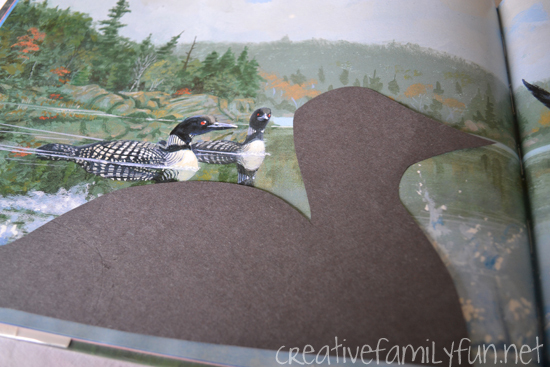 And to celebrate our state bird, we’re going to make a fun loon craft. Disclosure: I received a free copy of the book, Travels With Charlie: Across the Midwest, in order to create this post. All opinions and activities are my own. This post also contains Amazon Affiliate and other affiliate links. Please see my disclosure for more details. The common loon makes its summer home along the shorelines of our lakes. We’re always so excited to see a loon family, especially when their babies are little as they often ride on their mother’s back. Even when you can’t see the loons, you can hear them. Their call is distinct and sometimes quite haunting. If you want to hear a loon, check out the Cornell Lab of Ornithology All About Birds site. They have several recordings of a loon call. 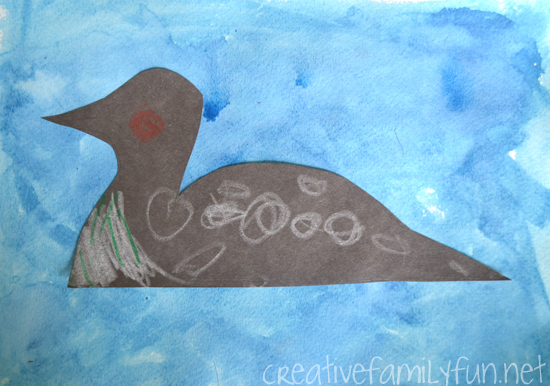 We are already big fans of the common loon and wanted to their image in an art project. 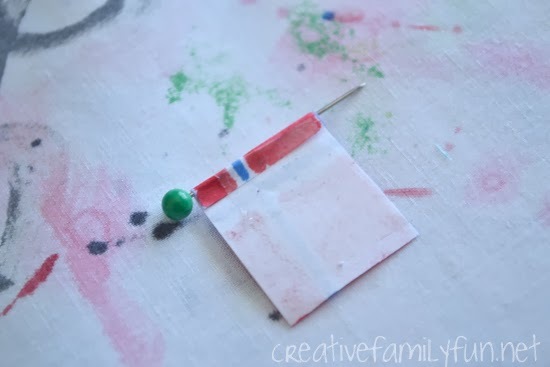 This project is easy to do with a very pretty result. We began by painting our background. 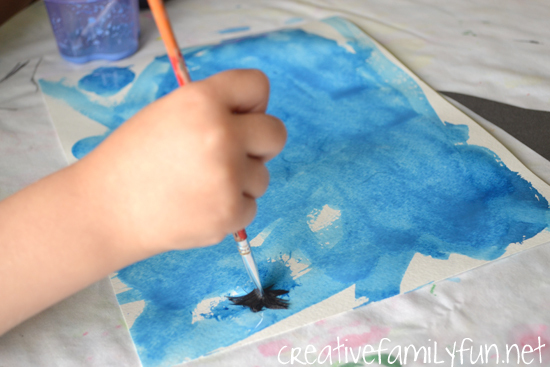 Loons are often found swimming on a lake, so we used blue and white watercolors to paint lake waters for our background. While waiting for our background to dry, we worked on our loon. We drew a simple silhouette on the black construction paper and cut it out. We copied an image found in the book, Loon at Northwood Lake by Elizabeth Ring. It’s a wonderful book to read if you want to learn more about the common loon. 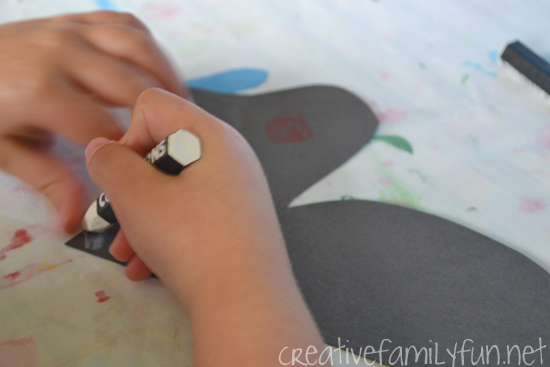 Next, we used our oil pastels to draw the details on the loon. My preschooler drew a red eye and white details. She opted for spots instead of the checked pattern on the loons back and included the white belly. She’s never been one to get bogged down in the details! Once our background was dry, we glued our loon to it. 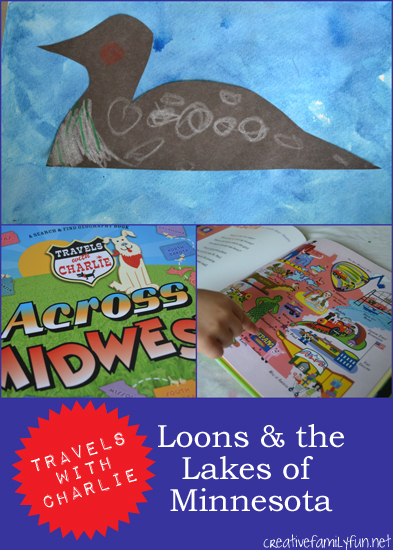 I love the results of our loon craft and love learning more about Minnesota. Travels With Charlie: Across the Midwest served as our jumping off point for this project. It was so much fun to hear about some of the more quirky finds in our state, like the Giant Prairie Chicken Statue and the Jolly Green Giant Statue. I’ve got to see them both sometime! Booking Across the USA is a collaborative project with over 50 bloggers participating. Stop by the landing page and see all the other stops on the route. You’ll be able to find a project for each of the 50 states. What fun! Hope you enjoy traveling across all 50 states.